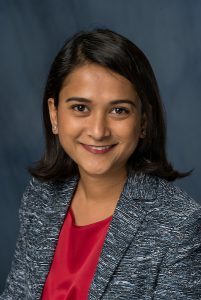 Upoma Guha, B.D.S., M.S., joined the faculty of the University of Florida College of Dentistry on August 13, 2018, as a clinical assistant professor in the Department of Restorative Dentistry Division of Operative Dentistry. Previously, she was on faculty at the State University of New York, or SUNY, in Buffalo where she spent three years as a clinical assistant professor. Guha earned her dental degree from the University of Dhaka in Dhaka, Bangladesh, in 2009. She practiced as a general dentist from 2009 to 2010 at the Bangladesh Dental College and Hospital before moving to Columbia, South Carolina, in 2001. She was a dental intern at the South Carolina Dental Center and then a graduate research assistant at the Arnold School of Public Health, part of the University of South Carolina from 2011 to 2012. In 2015, she earned her certificate and master’s in operative dentistry from the University of North Carolina in Chapel Hill, North Carolina, where she was also a resident and graduate teaching assistant. She then moved to Buffalo in 2015 when she joined the SUNY faculty. In addition to her primary focus of teaching the predoctoral and operative master’s students, Guha will be caring for patients in the college’s UF Health Faculty Practice. If you would like to make an appointment for your dental care with Dr. Guha in our Faculty Practice General Dentistry Center, please call 352-273-7654.